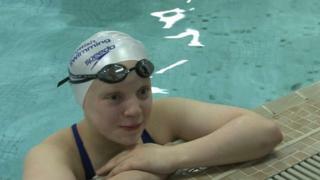 Shetland teenager Erraid Davies is training to secure a place in the Paralympics team for Rio 2016. The youngster won a bronze medal in the 100m Breaststroke SB9 category at the 2014 Commonwealth Games, when she was also Scotland's youngest ever Commonwealth Games competitor. BBC Shetland's John Johnston caught up with Erraid during training.